I completed my music degree at Edinburgh University in the late 1970s and then spent ten years working as a freelance pianist/musical director. Three years in the piano department of the London College of Furniture (now part of London Metropolitan University) under the tutelage of Malcolm McKeand led to City and Guilds and HND qualifications in piano tuning and technology. While still at college, I was offered a job with Bosendorfer, the legendary Viennese piano makers. A period of advanced training at the Bosendorfer factory in Vienna was followed by several years working as Concert Technician for Bosendorfer in the UK. 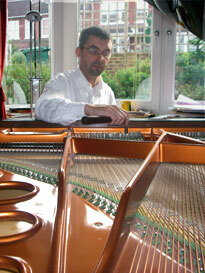 Apart from concert preparation and tuning, the job also entailed extensive servicing and rebuilding work. In 1998 I established my own business, based in Brighton, where my wife runs a ballet school, the Carroll Turner School of Dance. In addition to my private customers, I carry out tunings and service work for many of the main piano houses including Jaques Samuels, Marksons, Harrods, Steinway, Chappells of Bond Street, Bluthner, Chris Venables, Yamaha and Horsham Piano Centre.